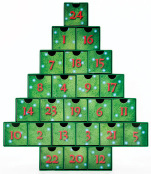 Count down to Christmas with these unique "Treasure Box" Advent calendars. Place a delicious treat, fun gift or thoughtful message in each of the 24 drawers. Beginning December 1st, locate and pull out drawer No. 1. Enjoy the treat and replace the drawer facing in the opposite direction to reveal a new image. Repeat each day.